Professional Hair and Beauty Stylist Required. Would you like the opportunity to be your own Boss from an already successful, established, business. Well, NOW is your opportunity to RENT A CHAIR at Stephanie's. Due to your continued support I am looking to recruit more quality staff. The following vacancies are available NOW! 1: Apprentice / Trainee stylist. Employed. 2: Fully qualified Beautician and Stylist. Self Employed. Shellac Autumn / Winter colours have just arrived. A massive thank you to all. 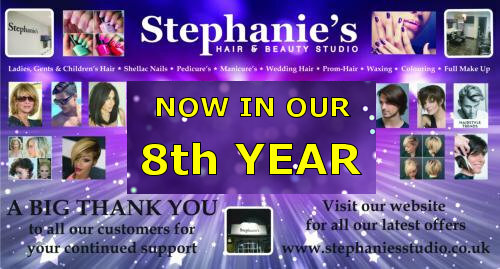 Stephanie is looking forward to her 7th year with new styles, products and services. nail treatments, nail extensions, manicure, pedicure, nail wraps, natural nails, nail art, fibre glass extensions, silk extensions, acrylic extensions and UV Gel extensions. 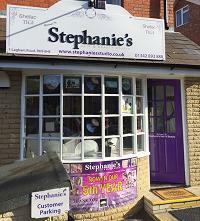 Stephanies beauty salon offer professional, high quality manicure and pedicure treatments at reasonable prices in Godstone, Reigate, Dorking, Limpsfield, East Grindstead, Oxted, Redhill, Bletchingley Surrey.